The Oadby & Wigston Community Safety Partnership is comprised of a range of organisations who work together to make the Borough a safer place to live, work, and visit. These organisations, including Leicestershire Fire and Rescue Service, Leicestershire Police, and Oadby & Wigston Borough Council, recognise that by combing resources, experience, and knowledge, the Partnership can offer an enhanced approach to tackling issues and concerns in the Borough, and offer a greater level of value for money within the work it undertakes or commissions. The Partnership is committed to listening to your views so we can improve our services, and tackle the concerns that are most important to our community. To do this the Partnership undertakes a survey each year designed to provide guidance on where its resources, and focus, would be best placed for 2019-20, as well as allowing its component organisations an opportunity to understand and assess the impact their current work has had on crime, anti-social behaviour, and safety within Oadby, Wigston, and South Wigston. Last year’s survey showed us that your most important concerns were ‘Motor Vehicle and Traffic Concerns’, ‘Littering or Fly-Tipping’, and ‘Burglaries and Distraction Thefts’, each of which were incorporated as priorities into the Partnership’s delivery plans for 2018-19, or adopted as a work stream for 2018-19 by partner agencies. Concerns ranked by Ward can be seen by following this link; Community Safety Survey 2017-18 Results (PDF Document, 638.82 Kb). 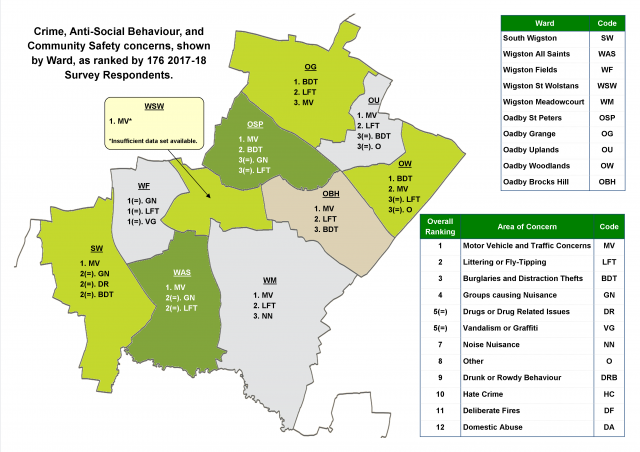 The survey also found that the majority of respondents (53%) felt ‘Very Safe’ or ‘Safe’ in the Borough, whereas 21% of respondents felt ‘Unsafe’ or ‘Very Unsafe’. Where details of why respondents felt ‘Unsafe’ or ‘Very Unsafe’ were provided through the survey the Partnership has strived to ensure that the issues raised were addressed throughout 2018-19. The 2018-19 Community Safety Survey has now closed. The findings from this year's survey will be published here in March 2019.